Mene did several sculptures of Goats and their young during his long career. A frisky Goat would be a challenging model but Mene captured the nature of these animals extremely well. 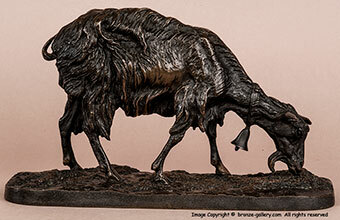 This fine bronze shows a Nanny Goat grazing peacefully. Her head is down as she eats and she is wearing a collar and bell so she does not become lost. This model dates to the early 1840s and our bronze has the flat sided rim on the base which is typical of those early casts. A rare model not often offered for sale, the Grazing Nanny Goat makes a pair with Mene's standing Billy Goat. The bronze has a rich dark brown patina and is signed on the base. 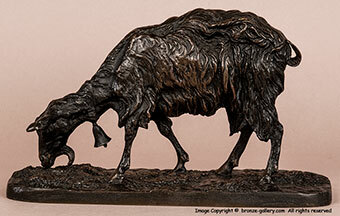 This model is illustrated in Payne's book Animals in Bronze on page 268.